"I think the Asian Art Museum likes us because we bring a younger, fresher energy that will attract a new customer base," Hong told Eater San Francisco. Part of the museum's ongoing renovation, the revamped cafe features counter ordering, two- and four-top tables and a large communal table that's the centerpiece of the main dining area. Customers may drop into the cafe without purchasing an admission ticket for the museum. 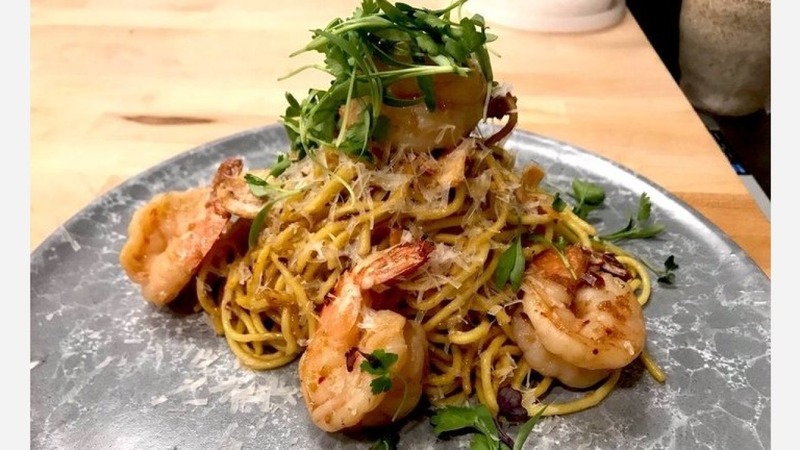 On the menu, look for items like kimchi fries with garlic aioli, miso avocado toast, jasmine tea leaf salad, and prawns served over egg noodles with garlic chips and parmesan. The new cafe has gotten good reviews thus far, with a four-star rating out of four Yelp reviews. "Friendly service, nice atmosphere and yummy food," said Cynthia T. "My entree was beautifully presented and flavorful. Definitely give this place a try if you're in the area or checking out the museum!" Cherylynn N. said the "service was friendly and I appreciated that the cashier asked for my feedback as I was ordering a milk tea before leaving. Food service was timely as I visited before the lunch rush. Digging the revamped minimalist space with an open kitchen." Sunday At the Museum is open Tuesday-Sunday from 10am-5pm.